It might appear to be just another sidewalk food cart, but San Francisco artists Justin Hoover and Chris Treggiari’s set-up – a mobile kitchen/café fashioned from industrial bikes and travel trunks – is actually a cultural project about globalization and dislocation. Touched by his Chinese grandmother’s tales of escaping war, and by her traditional cooking, Hoover started to collect recipes from people who have been forced to move due to conflict in their home countries. At predetermined times in public places, the pair sets up their cart and serves dishes along with the personal stories attached to them. 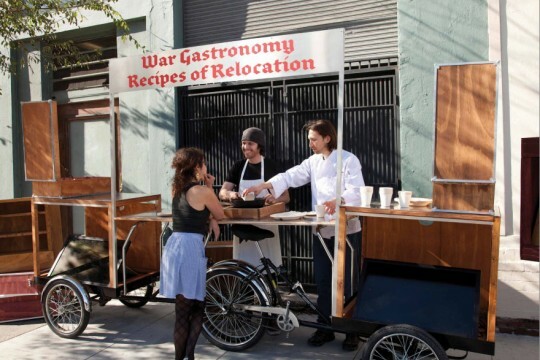 Passersby can contribute their own recipes to War Gastronomy’s ever-growing archive, feeding a performance/participatory work that brings the communal experience of cooking, eating, and sharing stories to public space.